For Marvel Studios, Thor is a very important movie and a critical piece of a puzzle that, when fully assembled, will culminate with The Avengers joining forces on screen in what could be the biggest super hero movie of all time. 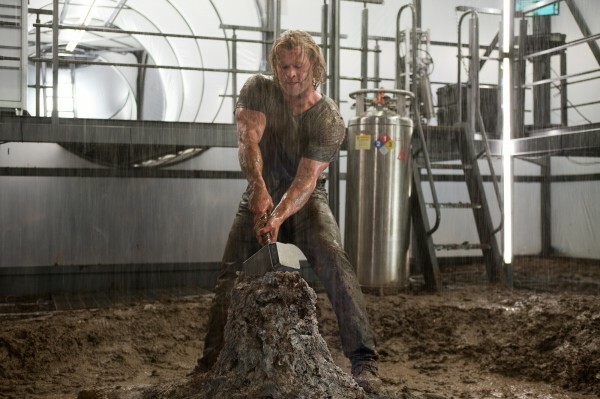 To help stack the deck, they have brought in a load of top notch talent including Natalie Portman, Anthony Hopkins, and Stellan Skarsgård along with rising star Chris Hemsworth who is tasked with bringing the God of Thunder to life. 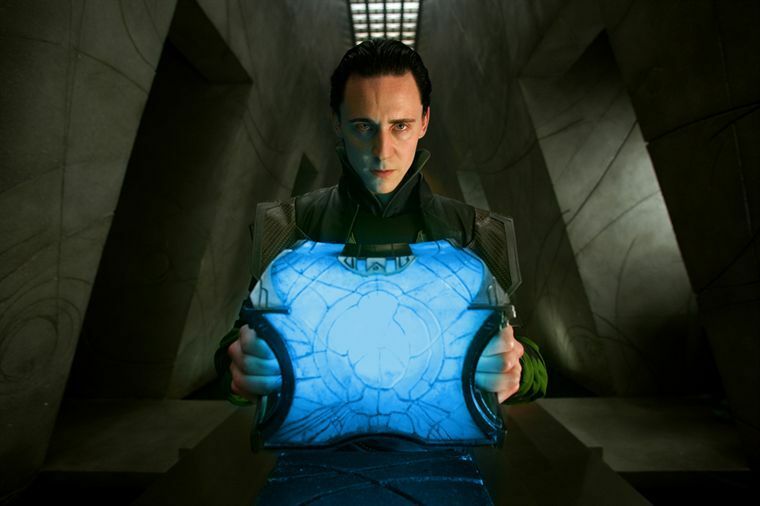 The first part of the movie goes in to a lot of the history of the Norse gods of Asgard and how they put a stop to the Frost Giants of Jotunheim in their plot to take over the nine realms which includes Midgard, or Earth as we like to call it. 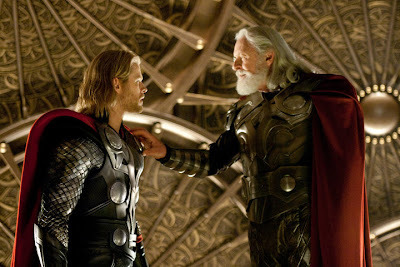 We see Odin, the king of Asgard teaching life lessons through those historical tales to his sons Thor and Loki to prepare them for their eventual place as rulers of their people. While the heroic Thor becomes vain and consumed by his quest for power, Loki has become envious of his brother's elder position which will have him sitting on the throne when Odin is ready to pass along his royal duties. On the day of Thor's coronation, an unexpected invasion prompts the God of Thunder to lead his friends hastily in to battle and eventually, with the help of Odin, barely escape with their lives and just as narrowly avoids breaking a truce with the Frost Giants that has held for many years. 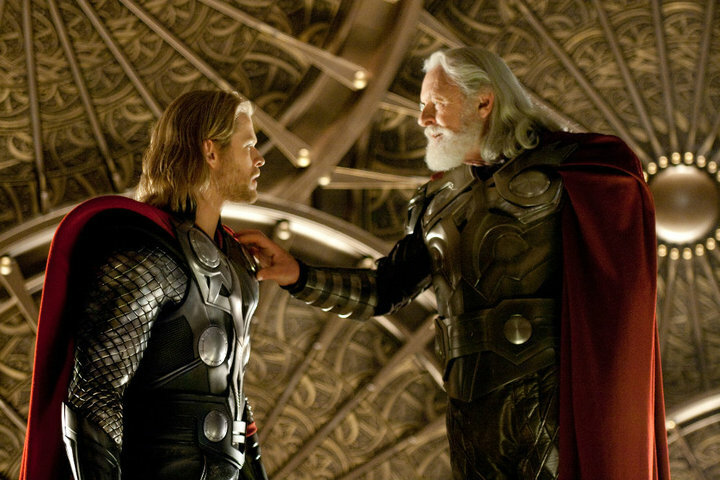 As punishment, Odin banishes his son to Earth, strips him of his powers, and puts a spell on the hammer Mjolnir so that only a person worthy of it will be able to lift it and use its powers. On Earth, Thor meets astrophysicist Jane Foster (Portman) and her companions Dr. Erik Selvig (Skarsgård) and Darcy Lewis (Kat Dennings) who have been hunting for signs of a wormhole event that has been appearing with increasing regularity. Little do they know that the secrets they are looking to unlock might just be answered by the tall, blonde man who seems to have literally fallen out of the sky. Eventually Agent Coulson and a S.H.I.E.I.L.D. team gets involved, acts of betrayal and treason take place, and Thor is put to the ultimate test and his success or failure will of course determine the fate of Asgard, Jotunheim, and even a small town in New Mexico. For a long time, I was concerned that translating Thor to the big screen would inevitably lead to something so unintentionally cheesy that it would fail completely. Considering that he is a combination of a comic book character and basically a God straight out of Norse mythology, you can see where the whole thing could go horribly wrong. Fortunately the fine folks at Marvel got two very important things right. They hired Kenneth Branagh to direct the movie and they cast Chris Hemsworth as the one and only God of Thunder. Branagh is a perfect choice to make a movie where Norse Gods and their old world way of speaking would have to be placed in to a modern setting without making the actors look silly in the process. 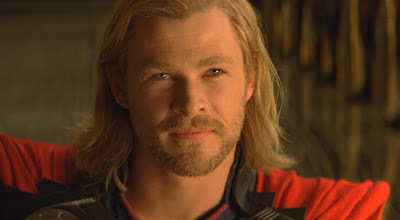 His experience with adapting William Shakespeare's plays in to major motion pictures gave him the knowledge bade to pull this off and, while Thor is not a comedy by any stretch, he adds just enough of that Marvel touch where you can start to believe you are watching a comic book come to life. As far as Hemsworth being cast as Thor, well, just look at the guy (see: above). Aside from looking the part, he's actually a really good actor and does a great job with the role. To most everyone's surprise, Marvel was able to put together a very good stand alone movie as well as adding another chapter to their Avengers saga. The story is really a really fun ride that doesn't get bogged down by having to give so much background information and the action sequences continue to raise the bar for what can be achieved both practically and digitally. As far as the 3D aspect, I don't know that it added a whole lot, but it also didn't detract from the movie and the quality of the transfer was just fine. 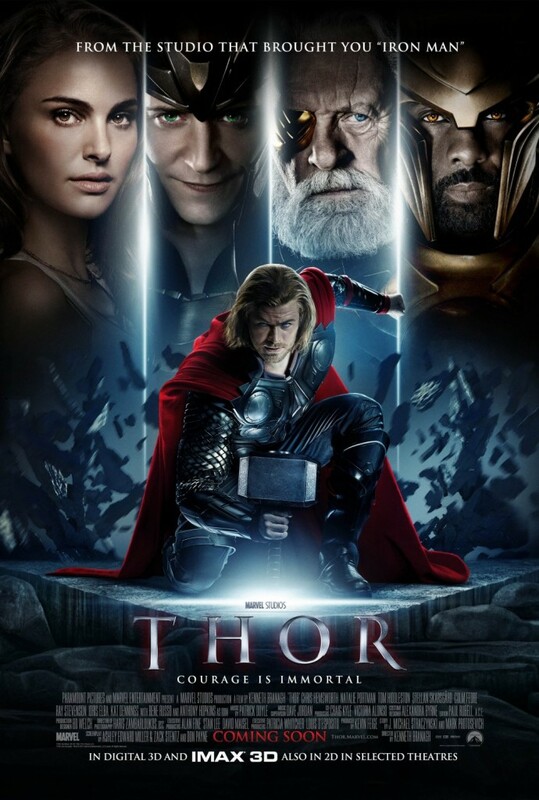 If you like your comic book movies to be full of great actors who know how to work this type of material then you are sure to enjoy a trip through the nine realms with Thor.